"President Donald Trump has been doing a lot of bragging about the stock market rally lately. How does it measure up? By some measures, the rally that took place during Mr. Trump’s first 30 calendar days in office has been the largest for any president’s first month on the job since 1945. Since inauguration day on Jan. 20 through Friday, the Dow Jones Industrial Average climbed more than 4%. 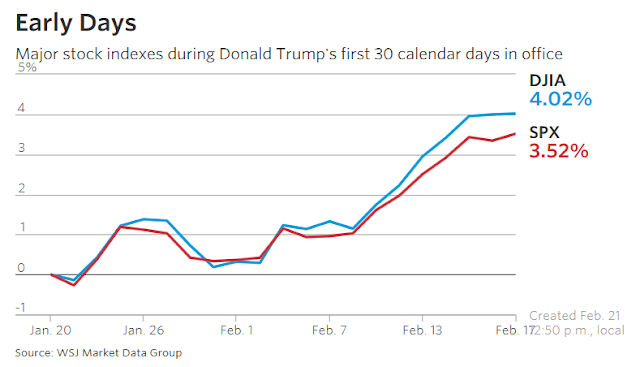 That’s the biggest gain over the first 30 days of a presidency since Franklin Delano Roosevelt was inaugurated for is final term 72 years ago, according to WSJ Market Data Group. During that period, the Dow rallied 4.1% to 159.01 points. Given that continued rise in the stock market, it’s no wonder that Mr. Trump wants to take credit for it. Investor and traders say that the gains reflect hopes that Mr. Trump will enact business-friendly policies like lower corporate taxes, looser regulations and infrastructure spending. As many are quick to point out, if Mr. Trump takes credit for the stock market rally, he also must take credit for any reversal. And many are worried that market is getting ahead of itself as valuations rise even without full clarity on the administration’s policy priorities, setting stocks up for a resurgence in volatility. Still, the rally under Mr. Trump ranks fifth among presidents inaugurated since the Dow Jones Industrial Average was created in 1896. In addition to Mr. Roosevelt, William Taft, William McKinley, and Theodore Roosevelt also took office alongside bigger stock market rallies. Mr. Trump’s rally ranks third among presidents beginning their first terms. The S&P 500, a newer benchmark, tells a similar story. The S&P 500 is up 3.5% since the president took office, the fifth best on record, and the biggest gains since Bill Clinton began his second term in 1997, according to WSJ Market Data Group. 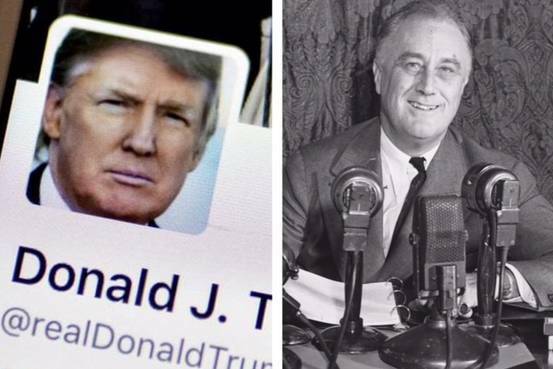 Mr. Trump ranks third among presidents beginning their first terms."